A general introduction designed to present a comprehensive, logical and unified treatment of the fundamentals of plasma physics based on statistical kinetic theory. Its clarity and completeness make it suitable for self-learning and self-paced courses. Problems are included. For advanced undergraduate and first-year graduate students studying plasma physics for the first time. For courses in classical mechanics, electrodynamics & mathematics beyond sophomore level, and for researchers in space physics and applied electromagnetism. Introduction. Charged particle motion in constant and uniform electromagnetic fields. Charged particle motion in nonuniform magnetostatic fields. Charged particle motion in time-varying electromagnetic fields. Elements of plasma kinetic theory. Average values and macroscopic variables. The equilibrium state. Macroscopic transport equations. Macroscopic equations for a conducting fluid. Plasma conductivity and diffusion. 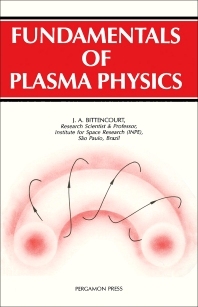 Some basic plasma phenomena. Simple applications of magnetohydrodynamics. The pinch effect. Electromagnetic waves in free space. Magnetohydrodynamic waves. Waves in cold plasmas. Waves in warm plasmas. Waves in hot isotropic plasmas. Waves in hot magnetized plasmas. Particle interactions in plasmas. The Boltzmann and the Fokker-Planck equations. Transport processes in plasmas. Appendices: Useful vector relations. Useful relations in Cartesian and in curvilinear coordinates. Physical constants (MKSA). Conversion factors for units. Some important plasma parameters. Approximate magnitudes in some typical plasmas. Index.